The Dhammakāya Movement is a Theravāda Buddhist movement founded in Thailand in the 1970s. It was founded by the Thai meditation master Phramonkolthepmuni, and is primarily represented today by its non-profit foundation, the Dhammakaya Foundation, and the Wat Phra Dhammakaya temple in Pathum Thani Province, Thailand. The movement is characterized by a literal interpretation of many Buddhist teachings, the teaching and practice of meditation, and by attempts to reform monastic discipline among ordained monks. 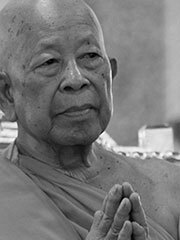 The Dhammakāya Movement has been known through its work of propagating Buddhism among Thai intellectuals, but behind the modern adaptations of the Dhammakāya school of practice lies an oral tradition motivated by the intricate teaching of founder Phramonkolthepmuni(1885-1959): a celebrated meditation master and the late abbot of Wat Paknam Bhasicharoen, Thonburi. This meditation school, even though it has many doctrinal elements to distinguish it from the convention Theravāda Buddhism and in some respects resembles schools of Mahāyāna Buddhism, has not been taken as heterodox by most Buddhists in the country. The Dhammakāya school of meditation is marked by its literal interpretation of Buddhist technical terms, (including the term dhammakāya) in their physical meaning, as described by Phramonkolthepmuni. Many sermons of Phramonkolthepmuni himself can be traced back to some schools of meditation in Southeast Asia preserved only in ancient meditation manuals. The word dhammakāya (or dharmakāya in Sanskrit) means the ‘body of dharma’ or the ‘dharma body’, and is most commonly encountered as part of the trikaya in Mahāyana Buddhist thought. The teachings of the Dhammakāya movement interpret the Dhammakāya as the essence of the being free of defilements above the level of the mundane, and thus the body of enlightenment, in the form of a crystal-clear living Buddha sitting in meditation at the centre of the body. This Dhammakāya as source of wisdom and true happiness, exists in all human beings and can be attained through the process of self-refinement and purification. The enlightenment of the historical Buddha is explained in this tradition as his mind becomes perfectly refined and purified to the same level of the refinement and purity of the Dhammakāya, and thus attains the body of enlightenment. The Dhammakāya is therefore seen as central to the Teaching of the Buddha. One factor which catalyzes this Foundation is the personality of Phramonkolthepmuni himself. The biography of his attaining dhammakaya in 1916 through the willingness to lay down his life in order to attain the Dhamma that the Lord Buddha knew, brought back the image of ‘self-sacrifice’ to the minds of his disciples. He thus inspires his disciples to overcome every obstacle blocking the progress of their spiritual life. One of the most important centres of the Dhammakāya Movement in the present day is Wat Phra Dhammakaya in Pathum Thani Province, Thailand: a large religious community of approximately 3,000 monks, novices, laymen and laywomen. Associated with Wat Phra Dhammakāya is the organization called the Dhammakaya Foundation which works on the international level and is a NGO/DPI member representing Buddhism in the United Nations. The size of the congregation attending Wat Phra Dhammakāya on major religious holidays has been known to reach 300,000 people. The major activity of the Foundation is the teaching of meditation and scriptural Dhamma. In recent years however, the work of the Dhammakaya Foundation has extended to education, international exchange, and humanitarian work with an emphasis on the younger generation. The mission of the disciples of the Dhammakaya Foundation to spread the understanding of Dhammakāya for peace amongst all countries of the world harks back to the original intentions of Phramonkolthepmuni. Since the establishment of this temple in 1970, the group of disciples of pioneer Chandra Khonnokyoong(1910-2000) have achieved many successes with recognition for its work from the Thai Palace, the World Fellowship of Buddhists and the World Fellowship of Buddhist Youth. These successes were, owing to jealous rivalry in Thailand, belittled or subject to mudslinging in the period 1998-2001 by the Thai press. Apologies to the Dhammakaya Foundation were published in full after the Thai newspapers and DMC.TV channels concerned were successfully sued for slander in the period 2003-4. Under the leadership of president Phrarajbhavanavisudh (Luang Phaw Dhammajayo)(b.1944) the image of the Dhammakāya Foundation has made a strong recovery and in 2004-5 had received further recognition for its contribution to world peace from organizations such as the World Health Organization, the Thai Senate and several peoples’ associations in the South of Thailand.